At Lane & Associates Family Dentistry we pride ourselves on giving back to the community and always doing everything in our power to help our patients succeed. On October 5th, 2018 our staff in the Garner NC location got that chance in an incredible life-saving way. Last fall shots were fired outside of our Cleveland Rd. dental office and our team had to think quickly. Across the street, Isai Ntirenganya was working at the E-Zee Auto Sales car dealership when he was held at gunpoint in an attempted robbery. In his efforts to escape, he was shot twice in his lower jaw & slowly made his way to the Lane & Associates office seeking help. Immediately, our Garner staff members went to the victim’s aid in the parking lot and brought him inside. Once inside, Dr. Matt Miller, a sedation dentist with prior military experience, and his surgical team were able to monitor and stabilize Isai before paramedics arrived. They began an IV in an attempt to replenish his fluids and account for blood loss while also using materials around the wound to attempt to stop the bleeding. Weeks after the traumatic event, Isai stopped by to visit the team in Garner that likely saved his life. He wanted to thank them in person for everything they did and our office was so thrilled to see that he survived the attack. 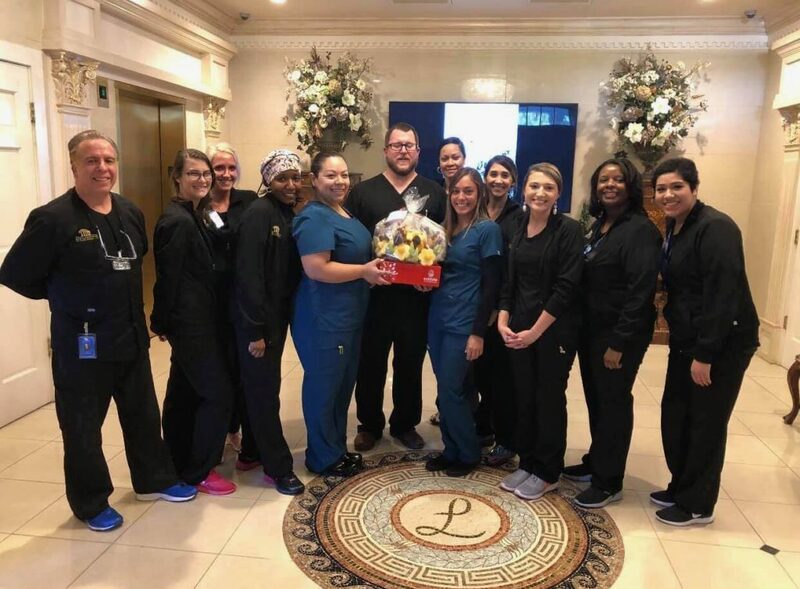 Shooting victim delivers Edible Arrangement gift to the Garner NC dental staff as a Thank you. This week it was confirmed that one of the suspects responsible for the attack has been apprehended. We are so proud of our staff for facing this emergency situation and also proud of the Johnston County Police Department for apprehending the suspect. Both have truly demonstrated what it means to be heroes. Read more about the incident at WRAL.com.